Battlefields and war cemeteries are not places I have visited often nor places I much like. I remember seeing on a back road in northern California in 1985 a battered sign which commemorated the last stand nearby of the local Native American tribe. Small recognition. Then there was the Little Big Horn and doing what Custer failed to do in 1876, which was look over the brow of the hill to see what was coming at him. My daughter visited Gallipoli in 2008 and thought it beautiful but not particularly sacred. Some Kiwis (Bintang Beer shirts and flip-flops) doing a haka at full tongue did not help the ambience. I would like to go to Gallipoli eventually myself to see where two great-uncles were fatally wounded, one swimming in Anzac Cove, the other throwing bombs back alongside Throssell, VC and later suicide. This great-uncle got gangrene and a burial at sea. I have no particular year in mind for the Gallipoli trip but will certainly wait until after 2015, for fear of bumping into a retired general or admiral conducting tour parties. At least today’s brass will be closer to the scene of the action than many of their predecessors. I saw parts of Vietnam in 2009 but missed Long Tan. On the way, I stopped off in Singapore and took a taxi up into Johor to visit the place (within a kilometre or so, anyway) where my uncle died and was buried in May 1943 at the end of his own private fight against disease and terror behind Japanese lines after his only ‘real’ battle as part of the 2/29th battalion fighting the Japanese at Muar River in January 1942. (Three hundred Australians killed in a day, about 14 times as many as at Long Tan.) This uncle’s name is high on a wall at Kranji War Cemetery, Singapore, as gravestones stretch down the green hill back towards the Besser brick entrance and the Singapore racecourse. Given this limited experience, I had no benchmark against which to compare the killing fields of the Ypres salient and the nearby Tyne Cot cemetery. (Strange how closely the latter name resembles Tarin Kowt, the dusty base in Afghanistan, the latest name to be etched in what our Prime Ministers like to describe as ‘the Anzac tradition of arms’.) 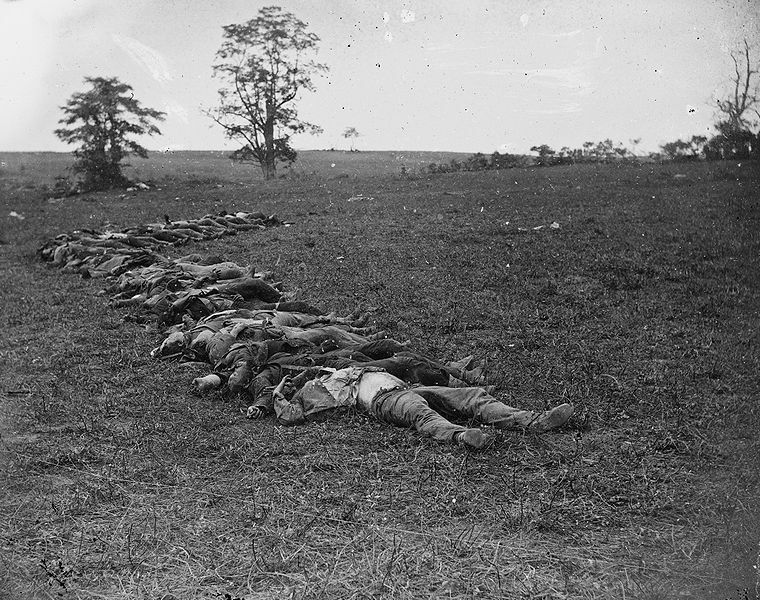 The rows of headstones at Tyne Cot today call to mind Alexander Gardner’s photograph of Confederate dead at Antietam during the American Civil War, bodies neatly lined up ready for burial. Bloody slaughter and mangling is followed by tidying up is followed by interment in geometric rows. ‘In line with the principles of equality and uniformity that govern official commemoration’, says the Department of Veterans’ Affairs, ‘headstones and plaques commemorating our war dead are uniform in design and in the information they contain’. But the headstones do show rank; perhaps the uniformity was more for the convenience of the stone mason during a war where 60 000 died. There was certainly uniformity in the cause of death: died doing his government’s business; deceased On His Majesty’s Service. 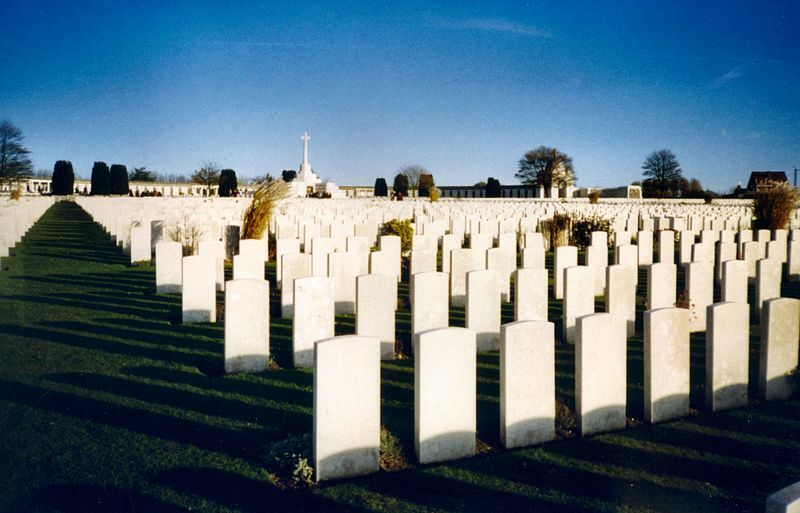 There are 1369 Australians at Tyne Cot (791 unidentified) out of 11 956 (8369 unidentified), making it the largest gathering of dead Commonwealth soldiers in the world and the largest gathering of dead Australian soldiers as well. There are also four dead Germans. The Australian headstones carry name, unit, rank, dates and a Twitter-like quota (66 characters including spaces) of commemorative sentiment chosen by a family who would never see their son or sibling again. Or ‘Known unto God’ for the unidentified, which is not so much sad as inconclusive, like ticking a residual box on an official form. Around Tyne Cot the various locations of the three battles of Ypres, including Passchendaele and associated confrontations, have reverted long since to their pre-1914 state, apart from the presence of tons of rusting shells, grenades and other ordinance, still regularly unearthed, and tens of thousands of the bodies of casualties, resting beneath the blue clay of Western Flanders, and occasionally being dug up and buried with appropriate honours. These continual reminders of war made our Belgian guide wary of commemoration spilling over into celebration, as threatens over the next few years in both Europe and Australia. The saddest dead are the German schoolboys at Langemark, rushed untrained into the war in its early days, now buried in thousands in a mass grave and rarely visited by their countrymen. The paddocks are lush and green. On the early December day when we visited, fog gave way to wintry sunlight just as we reached Tyne Cot. Around about, we could see acres of brussels sprouts for export alternating with muddy fields of maize stubble, the crop having been harvested for stock. There was just enough mud to give a hint of what it was like in those wartime winters a century ago. On land so flat that an elevation of a dozen feet counts as a ridge, stocky farmhouses looked prosperous, some of them equipped with solar panels. Neatness, efficiency and profit margin where once there had been senseless carnage. The care these dead receive has to make up for the lives they did not lead, the marriages they did not consummate, the children they did not have, the parents they did not see again and the goals they did not reach. Let the petals fall and be picked up, every single one.